Riding a motorcycle is dangerous. Luckily, bikes also give you the best possible tools to avoid crashing—incredibly powerful brakes, obstruction-free vision, excellent handling, and very grippy tires. Here’s how to use those tools, and your very own brain, to avoid one of these common motorcycle accidents. Safety gear doesn’t just help prevent injury in a crash, it can also make riding more comfortable, put you in better control of your bike, and help you be seen by other drivers. Bright colors on your helmet and jacket/suit will help car drivers see you, potentially avoiding some of the common accidents detailed below. 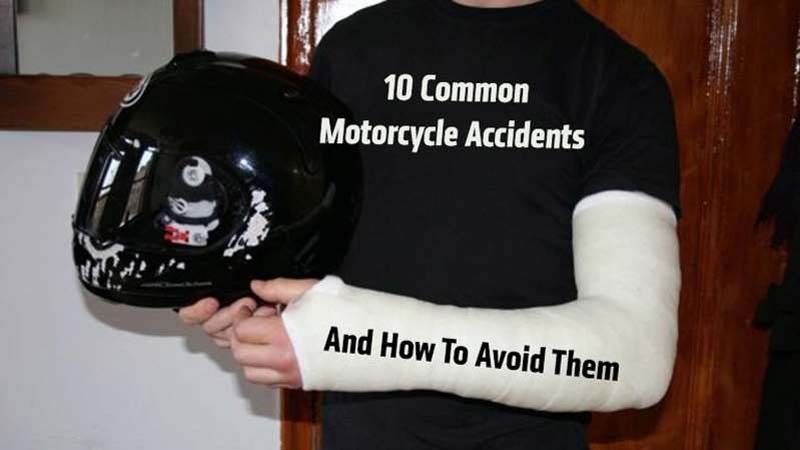 The most common motorcycle accident. A car fails to see you or judges your speed incorrectly, turning in front of you at an intersection. Blame inattention, distraction, blind spots and even psychology; a driver looking for cars perceives merely an absence of cars, not the presence of a motorcycle. How To Avoid It: Simple, you just need to see it coming. Part of your job as a motorcyclist is to develop a precognitive sixth sense. Look for signs that could indicate someone may turn in front of you: a car is at an intersection waiting to turn, there’s a gap in traffic near an intersection, driveway or parking lot. In either situation, slow down, cover your brakes and get ready to take evasive action. Yes, you do need to take something as innocuous as a car waiting in a turn lane as a major and immediate threat to your life. You also need to account for objects outside of your vision. Gaps in traffic indicate the possibility of someone coming through that gap, even if you can’t see them. Again, MAJOR THREAT, PREPARE FOR EVASIVE ACTION. And once you’ve identified said threat, you can work it through levels of severity. Is the driver clearly able to see you, without obstruction from their window pillars, trees or signs? Is that person actually looking? Are they looking at you? How are they situated in the road? What is their speed? Where are their wheels pointing? Look at their wheels, not the car – they’ll give you the first clue of movement. During all this, also be aware of what’s behind and to your side. Should you need to take evasive action, you’ll need to know your routes of escape. It’s no good braking in time to avoid a turning car, only to be swatted from behind by a tailgating SUV. What’s the road surface like? Is it going to be able to handle the full force of your brakes or are you going to lock them? You do know how to use the full ability of your brakes, right? Under no circumstances should you “lay the bike down.” Your best chance of survival comes from shedding as much speed as possible pre-collision, and you’re going to be able to do that best with the bike completely upright, using both brakes. Even if you only have time to lose 10 or 20 mph, that could be the difference between going home with bruises and going home at all. You’re out riding the twisties when, seemingly without warning, you round a corner to find a patch of sand/gravel/leaves/horse dung/whatever in your path. You put your front tire in it and wipe out. How To Avoid It: Don’t hit it in the first place. Ride at a pace where your reaction time and ability to take action fit within your range of vision. On the road, “Slow In, Fast Out” is an effective rule of thumb. Enter a corner wide, to increase your vision and at an easy pace. You can pick up the speed on the way out, once you can see. Trail braking is a slightly more advanced skill that you’ll need to learn and practice on a track before applying on the road. Using it, you brake all the way to the apex using the front brake before swapping brake for throttle. Since you’re already on the brakes and the bike’s weight is distributed forward, compressing the front suspension and increasing the size of the front tire’s contact patch, you can easily tighten your line by applying a little more brake or widen it by letting off. Doing so should help you avoid obstacles such as gravel. Another advanced skill, which is oddly controversial in rule-loving America, but which is taught by advanced police riders abroad, is to maximize vision by using the full width of the road, regardless of lanes. Vision equals safety equals speed. Again, learn this from a trained professional before trying it yourself. And now it’s unexpectedly tightening and you’re just not going to make it around. Oh no. How To Avoid It: Don’t be a dummy. Only ride as fast as you can see and use visual clues like telephone poles and signs to judge a road’s direction, even if that road is disappearing over a blind crest. If you do find yourself going too fast in a corner, the best approach is to trust the bike and try to ride it out. The bike is likely more capable than you are, so it’s really you that’s not capable of making it around. Take as much lean out of the bike as possible by hanging off, look where you want to go and be as smooth as possible on the controls. Do not whack on the brakes, chop the throttle or do anything else that may upset the bike and cause a loss of traction. Don’t panic if a peg or knee or something else touches down, just try to hold that lean angle, look for the corner exit and ride it out. This is another situation in which trail braking can be a real help, allowing you to safely shed speed while already in the corner. You’re riding in traffic when a car in another lane suddenly veers into the space you’re occupying. Remember, our tiny motorcycles can easily fit into blind spots and drivers looking for cars aren’t psychologically programmed to see motorcycles. How To Avoid It: Be aware of where blind spots lie and spend as little time in them as possible. If you can see a driver's eyes in their mirrors, then they have the ability to see you, too (But remember that still doesn't always mean they're looking – Ed.). Beware of situations where lane changes become more possible. Is highway traffic slowing, with one lane moving faster than others? People are going to want to be in that lane. Don’t be where they want to be. Look for signs of a car changing lanes: turn signals, wheels turning, the car wandering around its own lane while the driver checks his/her mirrors and, of course, the driver’s head moving. Be aware of all that, in all the cars around you, at all times, and you’ll be good. You come to a halt a stop sign/crosswalk/intersection/to avoid a family of baby ducks when the driver behind you doesn’t see you or isn’t trying to and plows into you at high speed. The most common car accident is a “fender bender.” A fender bender can kill a motorcyclist. How To Avoid It: Use cars as your very own crumple zone. A single car stopped at a multi-lane stoplight, with more cars coming from behind? Pull in front of it (wave nicely) and you’re cushioned from any subsequent impacts. Between a line of cars works just as well. No free crumple zones available? Stop to the side rather than the center of a lane, rapidly flash your brake light by tapping a brake lever, keep the bike in gear and your right hand on the throttle. Pay attention to what’s coming up behind you and be prepared to scoot away should it appear someone’s about to come plowing into you. Be particularly aware in situations where there’s bad visibility, at times when drunk driving is prevalent (do all the bars around you let out at 01:00?) and when stops are unexpected, such as at pedestrian crosswalks on very busy streets and stuff like those cute baby ducks crossing the road. You’ve seen it happen. A group is out for a ride when one of them stops suddenly or something similar. His buddy is too busy daydreaming to realize and hits him from behind. This has happened to us; it can happen to anyone. How To Avoid It: Make sure everyone is aware of proper group riding etiquette and knows to ride in a staggered formation. You’d be amazed how many people are unaware of this simple technique. Doing so increases vision and moves bikes out of line with each other, meaning a temporary lapse in attention won't result in a collision. Pick smarter riding buddies or do what I do: ride alone. Oh no, a deer/cute girl/cop/stopped traffic. You grab a fistful of front brake and, next thing you know, you’re lying on the ground, watching your bike cartwheel down the street. How To Avoid It: Learn to use your front brake. It might seem counterintuitive, but that front brake is the most powerful and difficult-to-master component on your motorcycle; it can alter your speed much more quickly than your engine. If you’re just learning to ride, have simply never mastered this skill or bought a new bike and need to learn it, find a big, empty parking lot and start practicing. From a set speed (say, 30 mph), start braking at a certain mark, then repeat ad infinitum until you’ve reduced your braking distance as much as possible. You should be able to feel the tire on the very edge of locking up and the rear wheel lifting off the ground. Then go and practice at higher and higher speeds until you can employ the maximum braking ability of your motorcycle reliably and safely. Or just buy a bike with ABS, remember you have it, and squeeze the lever as hard as you can when you need to make an emergency stop. The biggest gap in traffic was between a line of parked cars and a stationary line of active traffic. So you go scooting through it when, all of a sudden, Nathan-no-look swings his door wide open right in front of you. How To Avoid It: Never, ever, ever, ever ride between an active traffic lane and parked cars. Not just because of the opening doors thing, but because pedestrians step out, cars pull out so they can see, and for a million other reasons. Just don’t do it. If you do, somehow, find yourself in a door-opening situation though, follow all the advice above and brake as hard as possible. Even if a collision is inevitable, shedding even a small fraction of your speed can really help. Cyclists call the area next to parked cars, within a door's width “The Death Zone” for a reason. Stuff is coming out of the sky! That stuff is cold, wet and, surprise surprise, slippery. Listen to Douglas Adams and don’t panic. How To Avoid It: Does your bike have decent tires on it or were you silly and decided that running track rubber on the road was a good idea? Hint: it’s not. So long as you’re running reasonable tires and those tires aren’t worn out, you’ll be surprised at how well a motorcycle does in wet or even snowy conditions. Just slow down and be as smooth as possible on the controls. In the wet, stuff like manhole covers become super, extra slippery and you’ll need to watch out for oil and diesel on the road as well. Look for patches of rainbow and avoid those. If it hasn’t rained for a while, the first hour or so of rainfall is the most treacherous; it lifts all the oils and whatnot out of the pavement, floating it on top. Treat yourself to a hot cup of coffee and wait for a solid downpour to wash all that junk away. Also, beware of the limited visibility rain creates for other drivers and their general ineptitude; car drivers don’t seem to understand that slippery conditions necessitate longer following distances and earlier braking. Ron Haslam advocates keeping revs up in the wet. The thinking is that, should your rear spin up, you’ll be using a smaller amount of throttle opening, allowing you to regain traction much easier than if you’re riding at 30mph in 6th, at wide-open throttle. According to the 1981 Hurt Report—the largest study ever conducted on motorcycle accident causation—alcohol is a factor in 50 percent of all bike wrecks. How To Avoid It: Don’t drink and ride.